In traditional societies death is monitored very closely as a dangerous and redemptive force. Death must never become unbalanced with life. In traditional societies death is monitored very closely as a dangerous and redemptive force. Death must never become unbalanced with life. Looking Over the Edge points to the formal similarity of the tombstone and the back of a crib; the dying elderly's fear of the beyond becomes the newborn's eagerness as it comes into the world and peeks out of its crib. 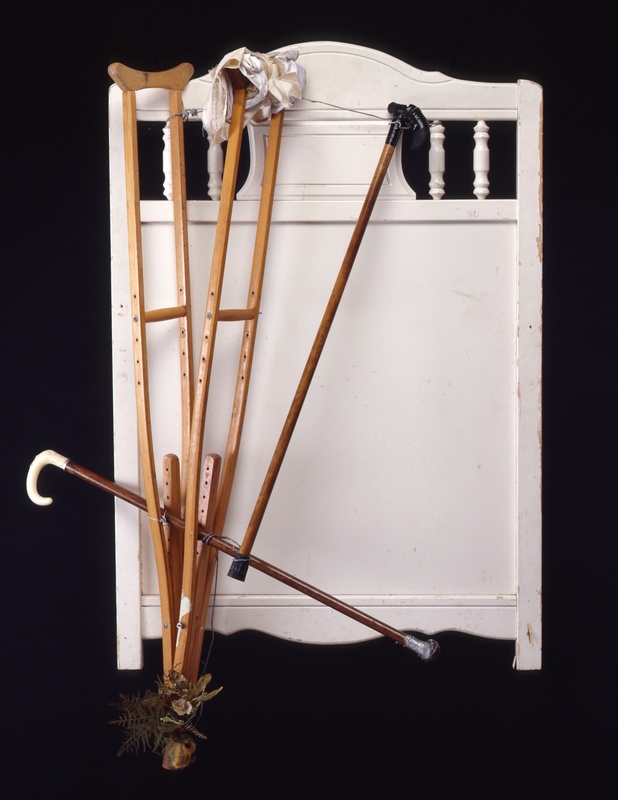 The visual effect of the crossed crutch and canes is a large X that modifies the crib/tombstone, marking it as a crossroads, an important spot.